If you're still debating getting in on the mineral makeup craze, this is one way to do it. 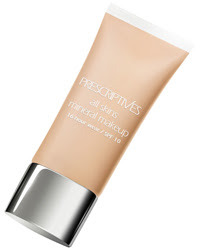 Prescriptives has just launched All Skins Mineral Makeup 16-Hour Wear/SPF 10, an easy to apply liquid mineral makeup infused with vitamins and minerals. It also contains the line's exclusive R.E.C. (Radiance Emitting Crystals), a unique complex of amethyst, rose quartz and calcite, to give skin extra luminosity. Plus the formula is lightweight and transfer-resistant, so it stays in place without feeling heavy or cakey for hours on end! It's available in 18 shades, so you're sure to find your match. And let's not forget the fact that it has SPF 10 to protect against harmful UVA and UVB rays! Prescriptives All Skins Mineral Makeup 16-Hour Wear/SPF 10 is available now at Prescriptives counters nationwide.